If you have a digestive disorder such as Crohn's disease or have recently had or will have a surgery on your digestive tract, your doctor may place you on a diet of easy-to-digest foods. This diet is made up of low-fiber items that will slow intestinal contractions and allow your digestive system to rest. No category of food is excluded, though you may need to temporarily change the type of high-protein foods you eat and how you prepare them. Meat, poultry and seafood are easy to digest if you choose tender, whole cuts or ground meat and avoid tough, gristly portions. Prepare each by roasting, poaching or braising until the meat is soft and well-done. Because a high intake of fat can increase the bulk of your bowel movements, opt for lean beef or pork, remove the skin from chicken or turkey and use as little added oil as possible when cooking. You can eat soft-cooked bacon occasionally, but avoid deli meats. Milk, soft or hard cheeses, yogurt and other milk-based products such as ice cream or pudding are easily digestible. Limit your intake to two servings each day; one serving is equivalent to 1 cup of yogurt or milk or 1 ounce of cheese. Choose low- or nonfat dairy products over full-fat ones to keep your fat intake low. If you're a vegan, a strict vegetarian or lactose-intolerant, you can substitute plant milks, lactose-reduced milk or supplement with lactase enzymes. 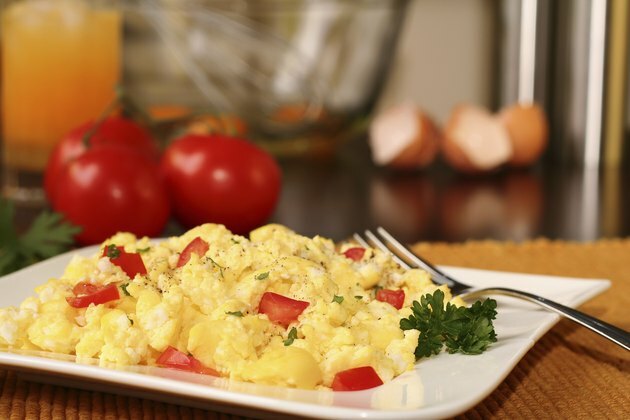 All types of cooked eggs, including hard- or soft-boiled, scrambled, poached or fried, are acceptable for people limited to easy-to-digest foods. One whole egg counts as one protein serving and is equivalent to 1 ounce of cooked meat, seafood or poultry. You should have no more than three whole eggs weekly if you have heart disease, high blood cholesterol or diabetes, advises the Harvard School of Public Health. Consider using egg whites or an egg substitute instead. Avoid all dried beans and legumes, nuts, seeds and high-protein whole grains such as quinoa while you're following a low-fiber diet. Creamy nut butter and tofu are allowed, however. One serving of protein is equivalent to 1 tablespoon of nut butter or 2 ounces of tofu. Avoid nut butters that contain chunks such as crunchy peanut butter and do not eat any commercial vegan or vegetarian product such as tempeh, seitan or veggie burgers until you've consulted your doctor.